Andy started out as a trainee at Crystal Palace in 1989, and although he was with the club for a period of five years, he never played a League match for the Eagles. He moved to Exeter City in 1994 in order to gain some first team action, but his spell with the Grecians proved to be a nightmare after he was red carded in two consecutive games – the second of these resulting in Exeter’s exit from the FA Cup. He never recovered the loss of his popularity and he subsequently joined Northampton Town in March 1995 on a free transfer. 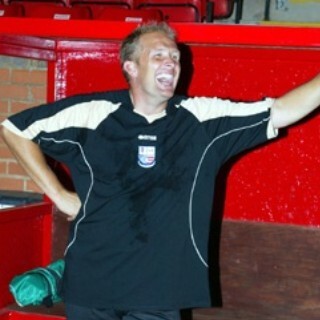 The five seasons he spent with the Cobblers were the most successful of his career, winning promotion in 1997. After some 160 games, he went on loan to Brentford in January 1999, before joining them on a permanent basis. During March 2000, he went on loan to Peterborough United although never made an appearance. The following season, he went on loan to Southend United (August 2000 – 3 months) and Colchester United (November 2000 – 1 month). The move to Colchester became permanent in January 2001, during which time he went on a two month loan to Oxford United in January 2002. The move to Oxford was made permanently later in March and he remaining there for the next two seasons. When Oxford visited Nene Park just after Chrstmas in 2002, his stunning performance saw Diamonds lose despite numerous attempts to beat him. He joined Stevenage Borough in the summer of 2004, before being released at the end of the season. He joined Diamonds on 17 May 2005 as cover for Jamie Young and made his debut in October 2005. After three consecutive clean sheets, a serious achilles tendon injury after just 12 minutes at Barnet led to his eventual retirement from the playing side. On 6 February 2006, he was appointed as assistant manager to Barry Hunter. He was released in May 2006 after Diamonds relegation, and became the goalkeeping coach at West Ham United under Alan Pardew. After Pardew’s move to Charlton Athletic, Andy joined him in the summer of 2007 as their goalkeeping coach. After Pardew’s appointment as manager of Newcastle United, Andy once again joined him, becoming their goalkeeping coach on 13 December 2010. After seven successful years there he joined Arsenal as their Under-23 Goalkeeping Coach and Head of the Academy Goalkeeper coaching.